Do you offer discounts for the trade? Can I trust buying online? Where are you located and do you have a showroom? Do you sell commercial quality products? Do you repurpose pieces or used reclaimed steel/wood? Can you copy this design made by somebody else for less money? Are you hiring, or need an intern? Do you do custom work? – Yes we do custom work! Most of the orders we do are custom. There typically isn’t an extra charge for this. Do you wholesale? – No we don’t at this time. We sell retail to everybody, there is no middle man, you buy direct from us. We can offer discounts for quantity orders of 3 or more. What are your lead times? – Contact us for this (greg@retro.net). They vary usually from 8-14 weeks. How can I order? – For casters, go to our caster page here unless it’s a custom order. For everything else, you can email us to get the ball rolling, or call 602-322-1111. Do you offer discounts for the trade? – We can for volume or reoccurring orders. Are you in any stores? – Not at this time, we sell direct. Can I trust buying from you? – That’s for you to decide. We have 100s of satisfied clients, have been in business since 2009, and have a 20,000 square foot shop . Our goal is to go beyond your expectations. You can read some testimonials here, check out our Facebook page here, or read some of our press. Authorize.net is our credit card processing agent. Do you build all the furniture? – YES! We make it all in house. All pieces are designed and built here. Where are you located and do you have a showroom? – We are in downtown Phoenix in the historic warehouse district. Our address isn’t posted because we don’t have our showroom finished just yet. 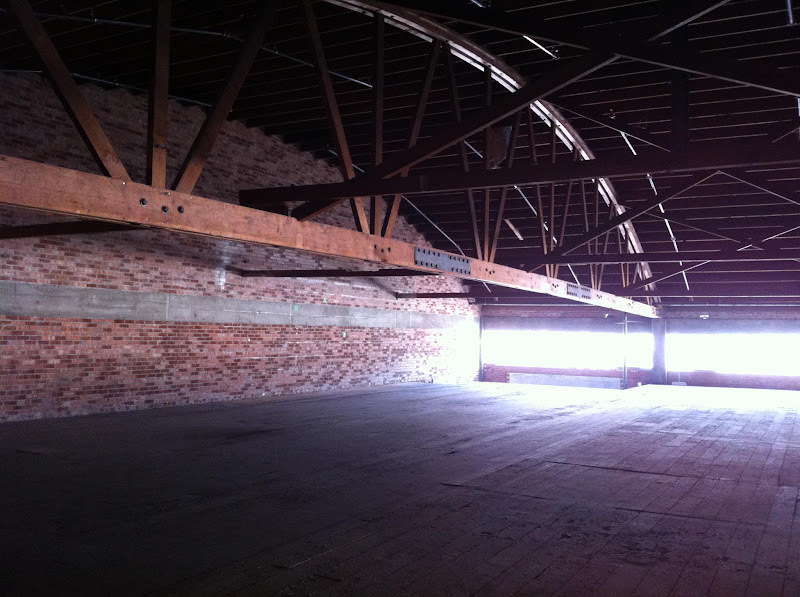 It’ll be done towards the end of 2012, but here is a picture of the space (yes it’s amazing). So if you want to visit, you’ll need an appointment. We don’t do tours as we’re too busy working. But if you want to buy and see our craftsmanship. Give us a call. How do I maintain my furniture? – All of our designs are built with steel that has an industrial clear coat. Steel doesn’t like water so keep it dry as possible. All steel will eventually rust, it’s just a fact of life. It may take a year, or 40 years, that depends on the humidity levels and exposures to water. A little rust looks good on our products, rust is a patina we use sometimes. For protection, you can apply a CLEAR furniture wax like Briwax. Wipe it on, let it dry, buff it off. All wood will need maintenance from time to time. Keep it dry, clean with a damp cloth, and it’ll look great for years to come. You can also use Briwax on it as needed for protection. I’ve had several pieces in my house for over 2 years and have had to do zero maintenance on it. Do you sell commercial quality products? – Everything we sell is commercial quality. I’d venture to say it’s a step above that, more like industrial quality. We use heavy gauge metal on everything. Our products usually weigh 2-4 times more than most out there. Why? We overbuild like they used to back in the old days. The 600 lbs desk we just shipped out last week was meant to last for at least 100 years. It’ll probably last for 1000 though as long as you don’t leave it out in the rain for 100 years. This is heirloom style furniture, not too trendy, and built to last generations while increasing in value. Do you have a price list? – For casters and chairs, prices are listed on that page. But everything else we do is custom so it’s impossible to make a price list. We post a price range for products which gives you a ballpark. Varying material costs will also cause prices to fluctuate some. How did you get into this business? – Here’s an article about that. What kind of wood and metal do you use? For wood –> oak, mahogany, pine, walnut, cherry are mainly what we use. For steel, American made mild steel is used mainly. Do you repurpose pieces or used reclaimed steel/wood? – Nope, we use all new materials and make them look old through various aging processes. Most people think our products are actual antiques. We distress them from head to toe. Can you copy this design made by somebody else for less money? – NO! We don’t copy other’s recent work, although we can do antique reproductions, or design something with that feel. And we can’t beat other companies prices that mass produce pieces as we custom build to order. Our products are more high end, not import crap from Asia. Do you ship internationally? – Yes we do, will need your address to get a shipping price. What other services do you offer? – You can read about that here.